Catalog Publication 208-028 (below) provides information on the DDG Supercompliant Toolholders; and Video VSCC30 demonstrates how far out of position you can be and still pick up the thread. Very few real life applications require anywhere near the amount of compliance that DDG Toolholders are capable of. VFLX16 is a video of a 4-Spindle Unit inspection station, built several years ago by a Korean company. Its purpose is to thread-verify four M8 inserts in molded automotive pedal modules. It was originally built without New Visa componentry, but it was retrofitted in early 2017 with New Vista FLX Spindles and DDG Supercompliant Toolholders. The application was challenging because the pedal modules might be hot, coming right off of the molding press; or they might instead be cold, if recently removed from a cold warehouse. So the threaded holes are often not in predictable locations. The original builder of the inspection station tried rubber coupling devices to gain compliance, but entry problems emerged, resulting in too many false rejects. 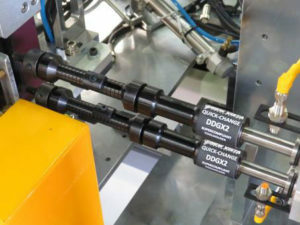 Retrofitting the station with New Vista DDGX2 Compliant Toolholders completely solved the problem: the tools now enter correctly every time and they then glide right through the thread. The DDGs are not just for thread verification. 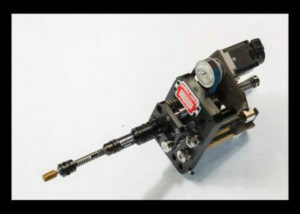 They will carry a lot of torque, so they are well suited to thread chasing or retapping applications, as well. The top photo below shows a DDG2X that is used on a New Vista WSH unit, for rethreading operations. Video VCTH9 demonstrates the compliance capabilities of a typical DDG Series Toolholder. The thread in that video is M12 X 1.75. While the DDG Series Supercompliant Toolholders are the most compliant and versatile toolholders ever, no one particular toolholder is best for all applications. For this reason New Vista also catalogs a number of other types of toolholders, covering a broad range of applications. You should consult with your New Vista applications engineer for any new application.